Mazes are an interesting act to see live: they might seem like what in your head looks like the archetypical early 90s band (possibly with the same energy), but they do have their own style that comes paired with a rather strong live show. Just before opening the night at Queens Social Club in Sheffield, we managed to get lead singer and guitarrist Jack Cooper to take some time to answer a few questions. Regarding touring, what do you think of the bands you’ve been playing with so far? 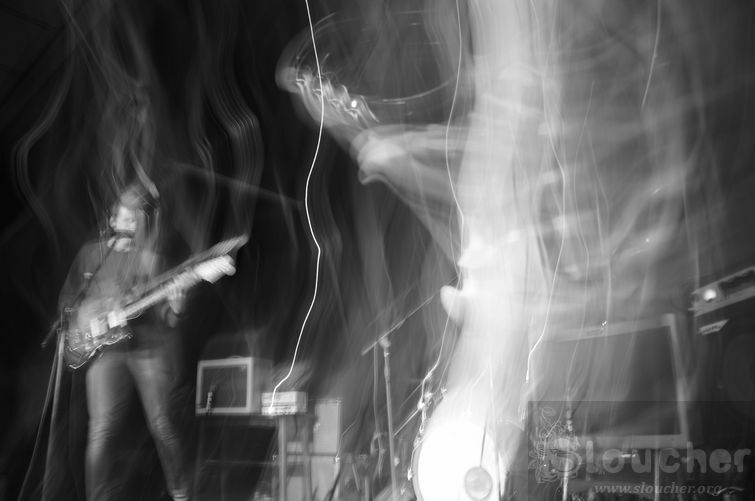 We did nearly 2 weeks with Dum Dum Girls a couple of weeks ago, that was really good fun. Conan, our bass player, he knows them because he plays in another band called Graffiti Island, they played together and had a split 7” a couple of years ago. That was a good start. We spent 45 minutes playing the show and then 24 hours driving and hanging out, but it was worth because all bands have treated us right and we all got on well. I wish all touring will be like that. Regarding the video for ‘Most Days’, where did the idea to make it an animated one came from? …and the ending is a little icky. Yeah, he pukes on himself and I was just: ‘Mom, don’t think this represents my life!’ Maybe when I was 14 (laughs). Do you think music is a form of freedom since your music is so vivacious? Yeah, it is. You can’t express how you feel in your day to day life. You get bogged down with day to day stuff and I think music for me it’s the one time where I can be myself and have a blast. I agree with that. Is there any story behind the cover of the album? Not really. Jarin, who plays guitar, found the photographer. It’s not photoshopped at all, he just used a long exposure and that’s why it looks like distorted faces. A lot of the album is, well, I wrote most of the lyrics and listening back to it, I think it’s quite nostalgic. You get to a certain age and you understand you didn’t appreciate what it was to be like to be a kid. The photo seems to resonate with the lyrical content to some extent, but we all thought it was a cool image. When you’re making an album, which part do you enjoy best and which drags? I suppose post production drags, the bit that is not in the studio and you’re kinda waiting. For me, recording the album felt kinda pressured, even if we had quite a lot of time compared to what it used to be. The pleasure I get from songs is the initial idea, you go and say “this sounds cool”. I find recording quite pressuring, I don’t know. It was fun, though, as we could experiment, but initial conception of the song is what I enjoyed. On that note of experimentation, I really like ‘Till I’m dead’. Love the little feedback at the beginning. We played it long for a while, but don’t play it any more. I had a slide which I was playing over the pick ups which gives it that kind of tension. I was pleased how it came out, it felt like the one song when we were recording that made me think “this sounds really good” and had a great feeling about it. Glad you liked that song! Since you are the lyrics writer: do you think lyrics empower music or is it the other way around? Lyrics for me are very much an afterthought. I do try, some of them are okay. Some of my fave songs in the world, I’ve listened to them hundreds of time but I don’t know the lyrics, maybe because that’s not how my mind works. To me, it’s definitely about melody and guitar parts, lyrics, I don’t really care that much (laughs). I listen to a lot of stuff in other languages and I don’t understand it all but I get pleasure from listening to it. There’s a nostalgic sound to your music: is it possible to make music without external influences? No, I don’t think so. If I were smart-arsey when someone asks who my influences are, I would say bands that have gone before. I spoke to someone the other day and this person was in a band where the rule was that during recording no one was allowed to listen to any music at all, which is quite…how do you do that? With a lot of the album reviews, people say weird stuff, saying it sounds like this and we get compared to Sebadoh or Dinosaur Jr., so after all the reviews have come in and I put a Dinosaur Jr. record on, I think “Is that really narcissistic of me to play that?” (laughs). It seems weird, I don’t like getting compared. I know people don’t have much time these days and will go ‘oh, this song is like Pavement‘ and if you are into Pavement, you might give it a shot, but it does feel stupid to me. I agree. I grew up in a family where I got compared to my brothers, totally irked me. Any ways, when you record, do you record digital or analogue? Everything except the actual recording was analogue. We used to Pro Tools in a way you would use tape, no editing, no square pushing or chopping of choruses. It was all much like Pro Tools was tape. And all the pre-amps, mikes and gear was analogue. It felt strange to me, you know, to see things on screen and go ‘what is all that?’, it’s ones and noughts! But feels good when it goes into vinyl and you have it. We used to record on cassette tape before and I think if we do a second album we’ll use tape of some sort. Yeah, it’s like arts and crafts at school, if you look closely you can see the little details, maybe a dent, but you have it with you. Even if the cover doesn’t say much, like the one Black keys did last year that only read “this is a Black Keys album”. Yeah, I like that. Anti-artwork. But about physical stuff, well, if your computer or ipod gets knackered, it’s gone. It doesn’t exist any more. Go with physical media. Lastly, when making a song, do you let feelings or thoughts decide? Is it about rhyme or reason? Ah, I think whatever comes to mind to us. None of us are technical musicians nor proficient, it’s whatever comes to mind and I’d like to stick to that because usually in any artistic process, your first idea is probably the best. I think it’s usually the purest and the most exciting, the spontaneous one. I don’t like over thinking stuff as it gets diluted. The pure thought anyone can have, the idea, that’s very interesting and I think that’s why we don’t try to over analyse stuff. First idea is the best or at least it’s gonna be pretty good. No problem! See you later. 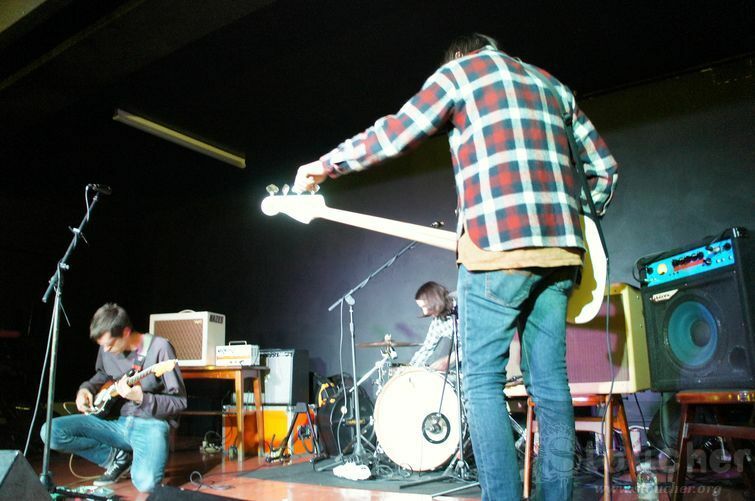 After the interview, Mazes went and did one pretty good set on a night filled with good music (review). 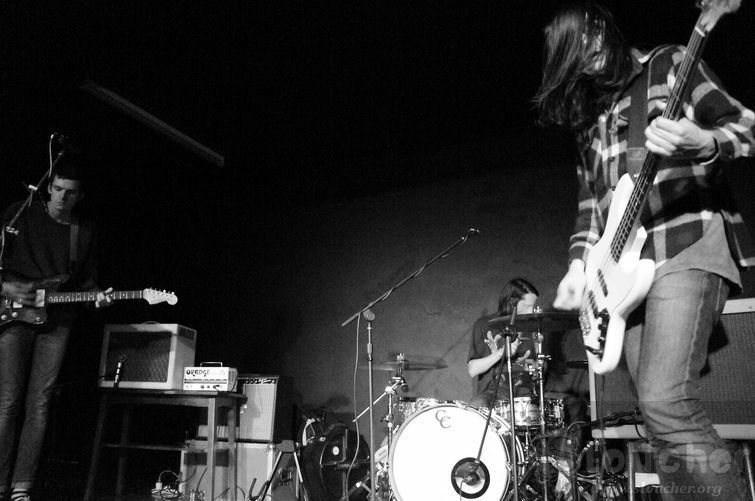 Their album, A thousand heys, is pretty nifty too (review). 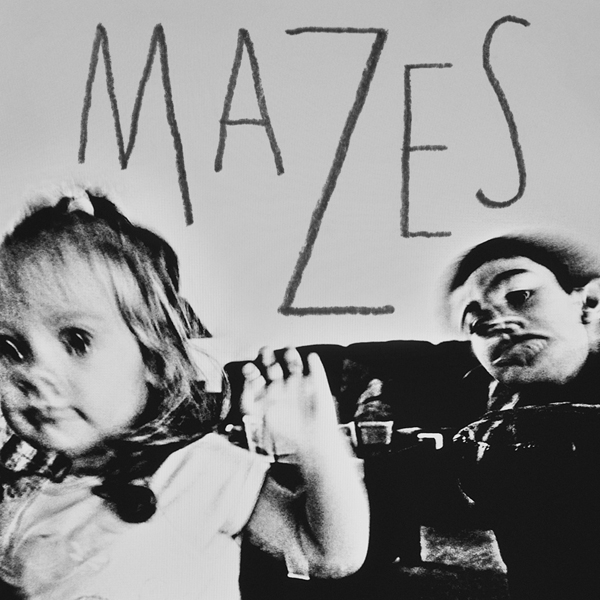 Mazes Website. Facebook. Twitter. Myspace. Last.fm. Spotify. Posted in Interview, InterviewsTagged A Thousand Heys, Interview, MazesBookmark the permalink.